Banair - Cone Resonanace Tester - Specialise in solving Test, Measurement and Design problems. The BA625 measures the resonant frequency of speaker cones in order to provide a simple and easily verified parameter for quality control. It has been designed to be robust, accurate and easy to use. The unit includes a frequency generator with crystal controlled digital Display. The oscillator operates in the range 10 to 2000 Hz and has 2 switchable ranges. The oscillator has both Course and fine adjustment to make setting straightforward. The volume can be continuously varied up to 30 Watts, and has a switch to mute the drive when not required. The motion of the cone is measured using a specially developed positional measurement sensor. This uses a modulated infrared beam and so is unaffected by ambient light levels or fluorescent lamps. This is a known problem with some other measurement techniques. The signal amplitude, measured by the sensor is displayed on an analogue meter. This has a sensitivity control for adjustment of the optimum signal reading from the sensor. The BA625 is designed to be used in conjunction with a test jig which comprises of a drive speaker mounted in a cabinet, with a support ring fixture mounted above this which holds the relevant cones to test, and suitable bungs to fit the cones. The semi-Automatic tester is an enhanced version. This unit applies a sweep frequency and analyses the frequency response using a Fast Fourier Transform. This makes it possible to test Cones or spiders with much smaller signals and in the presence of noise. 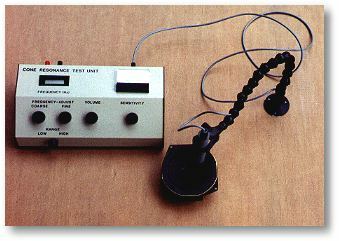 The part being tested is selected on the screen above (Fig 1). The required jig (rings and bungs) and the specification are then displayed. The picture above shows a typical PC display for a cone. The image on the right is the raw signal. The image on the left is the signal after FFT processing. After an FFT it is much easier to identify the resonant frequency. The result is checked against the cone spec and "Pass" or "Fail" displayed. All test results can be saved in an ACCESS database. Dimentions: 350mm(W), 180mm(D), 60mm(H) Front, 110mm(H) Rear. Frequency Range: 10 - 2000 Hz. Accuracy: +/- 0.1% of full scale. Displays: 12mm LCD 4.5 digit (frequency), Moving coil meter (signal power). Output Power: 30 Watts @ 8 ohms. Power Supply: Optional 110V / 240V A.C. 50 Hz. Sensor Dimensions: 120mm(L), 27mm(D), Cable 2 metres. Sensor Type: Integral Modulated Infra-red transmitter - receiver.